St. George’s Chapel is also closed to visitors on Sundays as services are held throughout the day. Worshippers are welcome to attend the services. Queen Mary’s Dolls’ House is currently closed until further notice. You’ll start your British adventure by visiting the beautiful Windsor Castle, set in the quaint town of Windsor. Steeped with rich royal history, you’ll soon discover why it’s the Queen’s favourite royal residence. As a home to the British monarchy for over 900 years, Windsor Castle has much to see and explore including the lavish royal State Rooms and world-famous masterpieces by the likes of Leonardo da Vinci and Rembrandt. From Queen Mary’s exquisite Dolls’ House that has running water and electricity to the venue for the most talked about wedding in 2018, Prince Harry and Meghan Markle’s wedding at St George’s Chapel, you will get to venture through it all. Next stop will be to the Neolithic stones of Stonehenge. 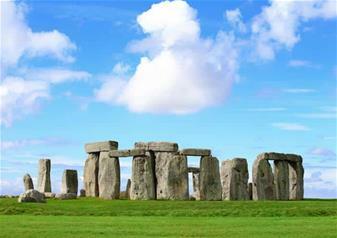 As one of the UK’s most famous attractions, Stonehenge promises to be an unforgettable experience. During this day tour, you’ll get to go up close to these ancient stones and piece together the evidence before you. How did they get there? Who put them there? Why are they there? There have been many theories for the existence of Stonehenge but this is your chance to work it out for yourself! The last stop of the day will be to the gorgeous city of Bath. As the first English city to become a UNESCO World Heritage, Bath is known to have both an abundance of history and beauty in equal measure. Brimming with Roman and Georgian architecture, the prestigious Bath Abbey and the idyllic cafes and boutiques that line the cobbled streets, it is a real sight to behold. Have the chance to visit the world-famous Roman Baths, one of the best historic attractions in the country. Although you can no longer take a dip in these waters, you can soak in the glorious views of the hot springs and the gorgeous area that surrounds them. You’ll also have the opportunity to sip Bath’s waters in the Pump Room and give your verdict on the taste! Estimated arrival time back in London is approximately 8.00pm. Once you’ve discovered Windsor Castle, Bath and Stonehenge, you’ll get to explore the capital with a free walking tour. Choose between two exciting, informative and unforgettable tours, The Royal Walking Tour and the Beatles London Walking Tour. You can embark on your walking tour at any point during your stay. This spring, have the extra special chance to explore the Royal Wedding exhibition at Windsor Castle. Celebrating the marriage of HRH Princess Eugenie and Mr Jack Brooksbank, this exhibition will display the Princess’s exquisite wedding dress, HRH Princess Beatrice of York’s maid-of-honour dress and for the first ever time, the Greville Emerald Kokoshnik Tiara, which was lent to Princess Eugenie by Her Majesty The Queen. Hassle free service. Very efficient and fast. Very convenient! We like it. 19 April, 2019 1 Adult 11am Entrance Select Meeting Point Golden Tours Visitor Centre Victoria 09:00 AMBaker Street 09:10 AM I have read and accept the terms and conditions.